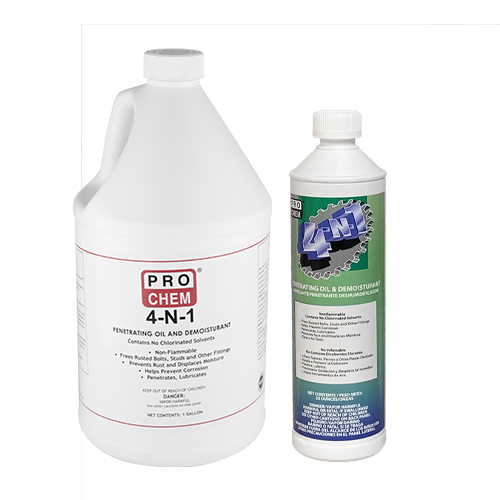 4-N-1 BULK | Pro Chem, Inc.
4-N-1 BULK is a high dielectric, nonflammable liquid that protects against industrial and atmospheric pollution, dust, abrasive matter and chemical fumes. It forms a non-drying, invisible film that prevents moisture-induced deterioration and malfunctions on electrical components and circuitry without any loss in conductivity. It creeps along surfaces and into cracks to lubricate, prevent rust and loosen frozen parts. It leaves a water-displacing shield and a lubricating film to make anything run smoother. 4-N-1 BULK has unlimited uses in automotive, marine, railroad and construction industries. For best performance and fullest protection, first clean object with degreaser solvent to remove grease, oil and debris. This will prevent material from becoming contaminated, especially when used in a dip tank. Apply as a spray, brush on or use in a dip tank. Allow wetted-out rusted parts to be immersed in solution for several minutes. Always keep container closed to prevent evaporation or contamination.